Elvis's "Blue Hawaii" was, of course, the title track of one of his first films after leaving the army. The song originally became well known because of another film, "Waikiki Wedding," from 1937, starring Bing Crosby and Shirley Ross, but it was not Crosby who made the original recording. This honour probably goes to Jack Denny and His Orchestra, with vocals by Sonny Schuyler. Denny and his band recorded the number on 19 February 1937, several days before Crosby. It was released on Master 105. Denny fronted numerous bands in the 1920s and 1930s. In 1931 he moved from Montreal, Canada, to New York City, and the following year started playing at the Waldorf Astoria Hotel. He developed a "society" sound, using no brass section, but adding extra pianos and woodwinds. His sweet sound was eventually overtaken when Xavier Cugat's more raucous style was featured as an opening act. 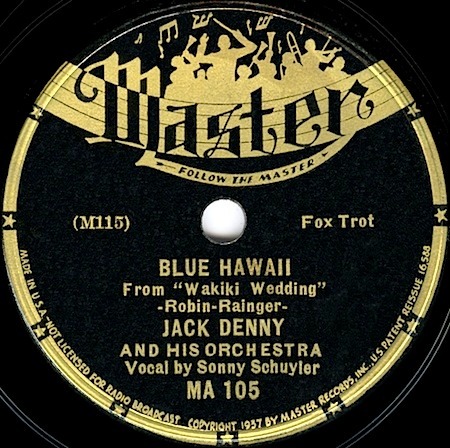 Confusingly, towards the end of the 1920s, another number called "Blue Hawaii" was popular. However, this was a totally different song, both musically and lyrically, written by Baer, Caesar and Schuster.